Please also check out our online training course - which we believe to be the best available at any price - now reduced from £147.00 to an unbelievably low price of only £20.00 (plus VAT where applicable)...!! 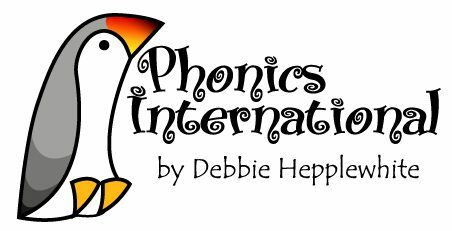 Phonics International (PI) is a highly-organised, systematic and yet flexible online synthetic phonics programme (program). Designed for all ages and needs and suitable for anyone who wants to learn to read and spell. Furthermore, PI is perfect for schools, tutoring and homeschooling. Teachers, teaching assistants, tutors, learners and learners' parents will all find the resources very supportive and effective. Student-teachers and teacher-trainers will also find great benefit from using our phonics programme for training purposes. Debbie's approach is the 'Two-pronged systematic and incidental phonics teaching and learning'[Click HERE]. This is supported by the ever-present overview Alphabetic Code Chart to show the spelling system in a 'tangible' format. Debbie has designed many versions of free printable Alphabetic Code Charts [Click HERE] and we also provide ready-made mini (tabletop) and giant (classroom display) versions if required [Click HERE]. PI resources are exciting, colourful, informative and enjoyable for teachers and learners to use. The resources are based on research and leading-edge practice. This is not a ‘pink and fluffy’ phonics programme! PI has a massive bank of unique and printable ‘rolling programme’ teaching and learning resources. These resources can be printed out to hard copy, viewed online by individuals or projected onto white screens for group or classroom work. So how much does this all cost? Well, as of January 2019, we have slashed the price from £99 to only £20 for a 12 Month Licence (plus VAT where applicable). We've also scrapped out 2-tier pricing (schools/parents) so all levels of access are exactly the same - £20 for 12 months! We still give free access to our 'Early Years Starter Package' as part of your licence. Seems like a 'no-brainer' to us! You can learn more about Debbie's other phonics programmes (Floppy's Phonics Sounds and Letters [Oxford University Press] and No Nonsense Phonics Skills [Raintree] ) on the 'About Debbie' page. For those who want to dive straight into the 'nuts and bolts' of how to set up and use the Phonics International programme and resources for transparent evaluation, click the 'Big Pink Button' below! For those who would like to read more about the rationale and structure of the Phonics International programme, we provide a number of information and guidance resources which can be accessed from our 'About' page. Further, we are providing the stand-alone Module (13) featuring the Phonics International programme's resources and guidance from our self-study 'Phonics Training Online' course for information and transparent review. Click HERE for the 'Alice' example mentioned in the above video. In 2017, Raintree Ltd published some of Debbie's core Phonics International resources which she purpose-designed as a 'pick-up-and-go' series of 9 hard copy Pupil Books and 9 parallel Teacher Books [plus in the 'No Nonsense Phonics Skills Starter Kit' there is a USB stick with additional resources such as class visual aids, entry assessment material and further guidance]. This material is being well-received for its immediate effectiveness and ease of use by teachers, teaching assistants and pupils alike. It is suitable for targeted support, intervention for special needs, and mainstream provision - for infants and primary-aged children. See the Year One Phonics Screening Check results on our flyer from an infant school in Cumbria, England, click HERE. The rationale for programme and resource design shown on the video below is also relevant to the Phonics International programme - see in particular the classroom practice at 5+ minutes which shows a Year One class trialling some of Debbie's resources. For detailed information about the 'No Nonsense Phonics Skills' series to enable transparent review, plus free training PowerPoints, click HERE. A trio of examples of Phonics International used in different settings.